Students of the Month have been named for December and January at Paynesville Area Middle School. Teachers recognize three students - one per grade per month - in the middle school for their attention and work in school and for their cooperation and relations with other students and the school staff. 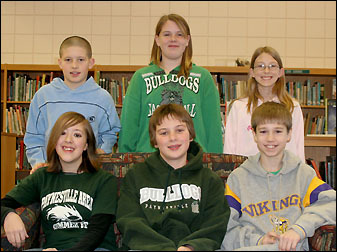 Students of the Month have been named at Paynesville Area Middle School for December and January. Honored for December were (front) eighth grader Holli Kern, seventh grader Jordan Schleper, and sixth grader Patrick Hoeft; honored for January (back) were eighth grader Sam Bungum, seventh grader Annette Johnson, and sixth grader Chloe Flannigan. Selected for December are sixth grader Patrick Hoeft, seventh grader Jordan Schleper, and eighth grader Holli Kern. Picked for January are sixth grader Chloe Flannigan, seventh grader Annette Johnson, and eighth grader Sam Bungum. Hoeft, the son of Bill and Nancy Hoeft, was excited and happy to be named a Student of the Month. He believes he earned the honor by paying attention in class. He is active in theater and plays baseball in school. He also likes to play sports away from school, as well as trapping gophers. His teachers said that Patrick is is a good student, polite, respectful, and friendly. Schleper, the son of Brenda and Pat Schleper, felt that his hard work at school paid off with the award. He thinks he won the award because of his good grades. He plays baseball, basketball, and football at school and likes to snowmobile, go four-wheeling, and play video games at home. His teachers said that Jordan is polite, responsible, and a good student. Kern, the daughter of Doreen and Randy Kern, said she was surprised to get this honor. She feels that she got the award because of her good grades and because she gets her homework done. She plays in the band, sings in the choir, and plays softball at school. Her hobbies are drawing, playing softball, using the computer, and hanging out with friends. Her teachers state that Holli is responsible, friendly but quiet, hard working, and a good student. Flannigan, the daughter of Kim and Tony Flannigan, was surprised and excited to get this award. Being good in class and getting good grades are reasons she feels she got the honor. She is a member of the student council and plays softball and volleyball. She also likes to go to basketball games and to hang out with friends. Her teachers said that Chloe is friendly, considerate, responsible, and a good student. Johnson, the daughter of David and Lori Johnson, was also surprised and excited to get this award. She thinks she was chosen because of her good grades and because of her friendliness. She plays basketball at school, and likes to play sports, be with friends and family, and talk on her computer away from school. Her teachers state that Annette is friendly, responsible, willing to help others, and a good student. Bungum, the son of Brett and Cheryl Bungum, said that it felt great to get this award. He believes getting along with people and getting good grades were why he was picked for the honor. He plays in the band, sings in the choir, and plays baseball and football at school. His hobbies include music, sports, and hanging out with friends. His teachers describe Sam as mature, responsible, respectful, and a good student. These six students are the second group to be honored as Students of the Month this school year. Already honored were sixth grader Connor Hacklander, seventh grader Megan Wuertz, and eighth grader Krista Topp for October and sixth grader Megan Schmidt, seventh grader Dylan Sheridan, and eighth grader Eric Wolbeck for November.